Calculating one’s strategy–identifying one’s goal and the steps to achieve it, evaluating the range of options available to all relevant actors in response to one’s own moves, determining one’s counter-move to each, etc–is the foundation of rational foreign policy. The frequency with which state leaders are criticized for “having no exit strategy” when they choose to go to war suffices to indicate how shockingly real is the danger of committing a nation without having thought the problem through. Yes, the leader no doubt “knows what he wants,” but that may have little to do with having identified a realistic goal. If errors of judgment by state leaders occur at such a simplistic level, then at least the good news is even very basic, easily applied techniques can make valuable contributions to enhancing decision-makers’ thinking. If leaders neglect to consider that an ally may have a different goal or that a graceful way to declare victory and “get out” may be hard to find, then the game will be lost from the first move: no amount of intelligence gathering or analysis of detailed scenarios and behavioral dynamics is likely to overcome such fundamental errors of judgment. The road to effective foreign policy is always hidden in fog, but a little straightforward strategic calculus will at least get the foreign policy car headed in the right direction, and some surprisingly easy techniques can help a government avoid driving straight into a tree. One of the most discouraging yet common errors of judgment by leaders is to get fundamentally wrong the answer to the simple question, “Is there room for compromise?” The answer may well depend on a logically simple redefinition of goals. Defining one’s goal abstractly can make a disagreement amenable to a mutually attractive solution appear impossible to resolve except through war. If the real problem is “in one’s head,” then some simple Venn Diagrams may clear decision-makers’ vision. The purpose of Venn Diagrams, which consist of circles that each contain a set of concepts, is to expose the degree to which the concepts overlap. 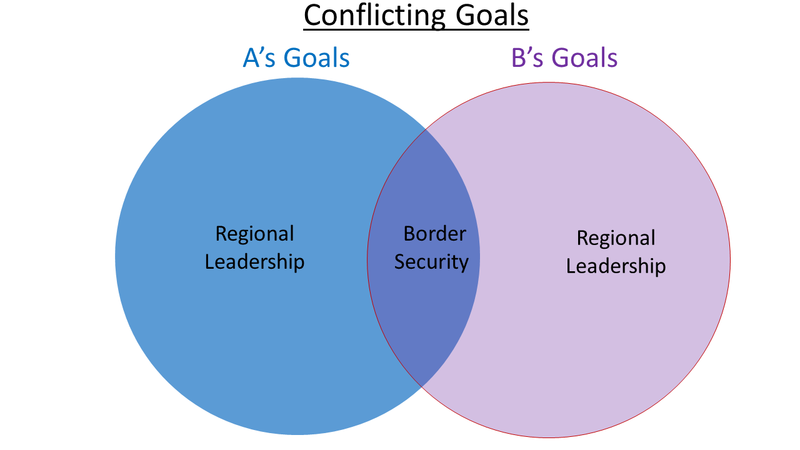 For example, do any of State A’s goals match State B’s goals? Any overlap in goals constitutes room for negotiation. Is the region of overlap the correct size? How can it be expanded? Are the goals defined in the right terms? Are the goals mutually exclusive or can both sides simultaneously achieve some common goal? Considering these questions is likely to help avoiding unnecessary diplomatic pitfalls that commonly result from ethnic or ideological biases or simply assuming that defeating the adversary is the only solution. 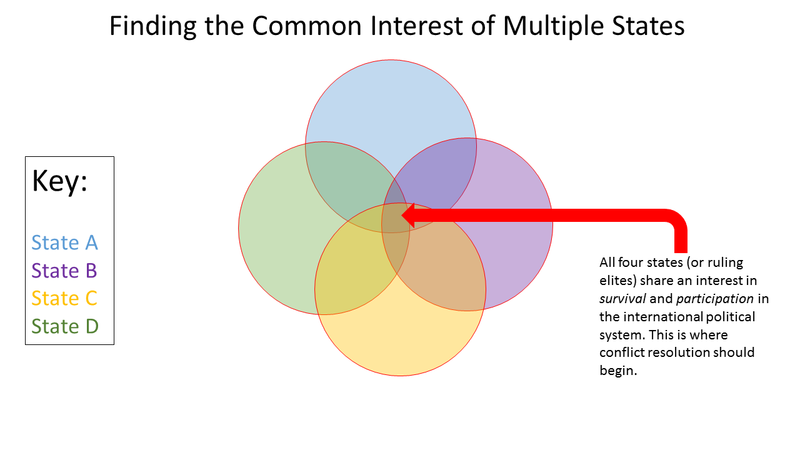 Enhancing the realism of Venn Diagrams by incorporating multiple actors is intuitive. The above diagram illustrates a theoretical diagram of four actors all of whom share, to the same degree (an obviously unrealistic simplification in what could only be an initial simplification for the purposes of enabling all members of a decision-making group to start on the same page). Figuring out ways to enlarge the tiny area of mutual agreement constitutes the challenge to decision-makers. As valuable as basic questions [“Is there room for compromise?” or “What is our real bottom line?”] may be, the answers do not take the place of a serious strategic calculus – a calculation of the strategy that seems (for one should never assume that the original calculation will be anything more than an initial guideline subject to constant revision) to offer the best route to achieving national goals. A strategic calculus providing professional guidance suitable for national decision-making can hardly be done mentally but committing the arguments and data to paper will most likely generate more text than anyone will absorb. In between these two extremes of naive superficiality and overwhelming detail with endless layers of cognitive dysfunction (prejudice, recency, group think, etc.) should lie a simple method of laying out core alternative strategies. An appropriate method will serve to facilitate mutual comprehension within the strategic planning group, promote intellectual honesty, underscore the full range of major options available to the state as well as other key actors, and facilitate identification of the anticipated course of events. That path into the future will of course turn out to be incorrect, so an appropriate method should also be easy to modify. For example, a state decides that an economic embargo of an antagonist is warranted, that allies will go along, and that the victim will initially resist only with economic methods. It calculates that it should strengthen its position by following up its embargo with an offer of talks, anticipating that such an offer will provoke discord within the adversary’s camp while cementing relations with uneasy allies, etc. The type of binary decision tree that constitutes the first, graphical step toward game theoretic analysis offers a candidate method, albeit with the weakness of rapidly getting awkward in the face of the combinatorial explosion of potential futures (a problem that can be alleviated by severe tree pruning). The game theoretic tree typically applies to two players, a restriction that fundamentally weakens its utility for international relations, where it is hardly reasonable to assert that bilateral state relations can be evaluated without consideration of the role of at least a few other states. To address this weakness, the method is extended below to address a tripartite relationship. Adding additional actors is straightforward in principle and could perhaps be made straightforward in practice, once again, via very cautious, informed tree pruning. The first round of the strategic calculus pictured here generates eight scenarios. 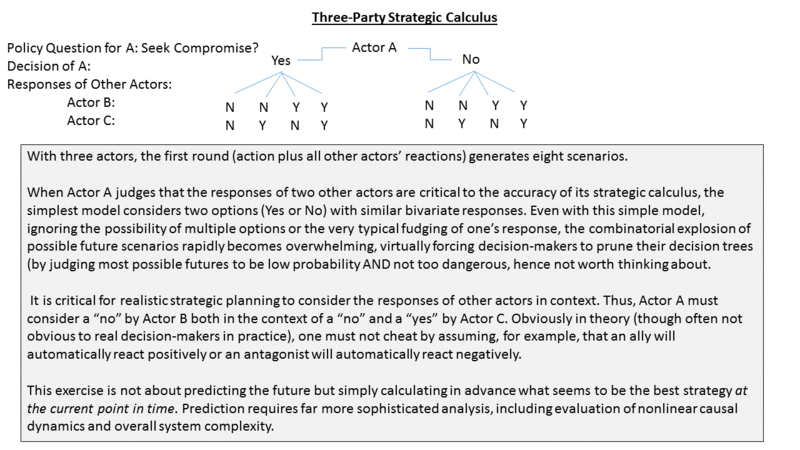 For example, starting from the left, the first scenario depicts Actor A deciding to seek compromise, a move with which both B and C disagree. Decision-makers could analyze this first round in more depth by estimating the probability, time sensitivity, and importance of each scenario. Alternatively, the calculus could be followed through a few more rounds. Since decision-makers quickly get caught up in believing in a scenario because they want it to become true, the most valuable contribution of this method may be to take advantage of it to focus on evaluating the probability of scenarios that one dislikes, exploring options for responding to or evading such threats.